“Sarah’s” pilot, Laura had recently retired from the US Air Force. She had been flying transports out of Elmendorf Air Force Base and logged thousands of hours. The happily married Laura’s Cessna 172 is equipped with a state-of-the-art glass cockpit, which is perfect for these flights. 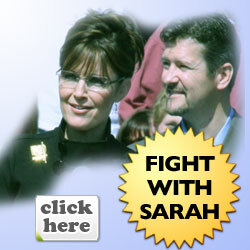 “Sarah’s” husband would be joining her in Washington later, along with their children. “Sarah” and Laura met – “call me ‘Sarah’ – she said. After some small talk and stowing their gear, Laura gave “Sarah” her safety briefing, checked to be sure they both had their passports and customs forms for entering Canada, then called Anchorage Center for clearance. The flight would go past Big Lake, which is west of Wasilla so that the plane could reach 10,000 feet, then turn back, climb to 11,000, where it would stay until Eileson Range. “Sarah” could see all of Wasilla beneath the right wing starting with the airport she had just departed. The Curtis Menard Multi-Use Sports Center that she made possible came into view, followed by her house and the Wasilla Bible Church. City Hall – where she had served as Wasilla’s Mayor and Councilwoman, and sat in second grade – slipped by. She could see the Frontier Mall, where she had gone to Mocha Moose to get her favorite coffee, Good Morning Alaska, five pounds of which was traveling with her. Flowers by Louise passed thereafter. They had sent her many a bouquet from supporters all over the world. She could see Wasilla High School, home of the Warriors, where she won that basketball game against Service High so many years ago – on a broken right ankle. That game would chart the course for the rest of her life. The Starbucks where she got her skinny white mochas passed by, followed quickly by the Beehive Beauty Shop, where Jessica Steele’s half and beehive up-do’s became “Sarah’s” trademark styles. Steele also invented the Sure Grip Hair Roller, which Vidal Sasson brought to market. Very quickly the Heath house slipped under the right wing, then the Grouse Ridge Shooting Grounds, where the baby shower for Piper was held. The final goodbye to the Wasilla area was Hatcher Pass, where the front cover for Going Rogue was shot. She saw the turn-off from the Parks to Glenn Highway – beelines up and down these roads punctuated her life. The flight proceeded to Glenn Allen slipping in an out of cumulus clouds suspended over a mountainous canyon as the Alaskan midnight sun finally set and gave way to evening, then morning twilight – hours that are considered deep night in the Lower 48. The moon rose off the left wing. “Sarah” had seen this all her life, but was still fascinated by it and awe-struck by the beauty unfolding before her. Off the left wing, Beaver Creek beckoned. “Sarah” could see on the GPS that the flight was leaving Alaska. She felt a pang, and Laura detected it. The transition was not obvious in commercial flights flying high and fast and with no moving map. “I took you out of Alaska, but no one will ever take Alaska out of you,” Laura said as the plane crossed the border. “Sarah” smiled. “Thank you.” Laura was vectored around for a visual approach to Runway 31 facing the northwest. Evening twilight was turning into morning twilight. Following a smooth landing on the small gravel strip, the pair went to the airport office to clear immigration and customs. Five more flights would be made in Alaska before they would re-enter the United States.